We’re opting for the Isuzu D-Max. We looked at a model from China, the Foton Thunder. At 900,000 pesos it was a reasonable value and my asawa and I both loved the look of the truck. But it only came in a manual transmission and though Mr. Lin, at the Foton Dealership in Iloilo City, was going to give us an additional discount if we purchased the floor room model (which had 3,000 miles on it), my asawa, who has a valid driver’s license in the Philippines, will be the primary driver and doesn’t think she could learn to drive a manual transmission vehicle. We checked out the Toyota Hilux in Iloilo. The salesman never followed up with a better price for us and they only had a 4×4 automatic transmission model in stock. Again, too pricey. 1.6 million PHP, same as the Chevrolet 4×4 AT model. Personally, I like the look of the Chevy Colorado and Toyota much better than the Isuzu D-Max. But it comes down to two things for us: the price and the availability of an automatic transmission. Our negotiated deal with Looney at Isuzu is approximately 27,000 US Dollars. We could have saved 7,000 bucks if we would have gone with the Foton Thunder manual transmission model and saved even more if we would have been looking for a single cab, and not the crew cab passenger trucks in the Philippines, we are looking for. The 27,000 price tag for the Isuzu D-Max includes window tinting, bed liner, floor mats, free LTO, Land Transportation Office Registration, for three years, and one year of insurance. The price is comparable to what a similarly equipped Colorado in the United States would cost. So as soon as our funds from our bank in America are transferred, we’ll be paying Looney (Tunes), his self-proclaimed moniker, a visit at the Isuzu dealership in Iloilo, the Philippines. I’ve done a lot of online research. I even considered looking at bank repo’s, but decided that buying a new vehicle would best suit our needs. We narrow our search and the end result, the Isuzu D-Max. After not owning a vehicle since our move to the Philippines over five years ago, it will be handy to have our means of transportation again. Again, my asawa will do the bulk of the driving, only in Guimaras. She’s a good driver despite getting some driving lessons from me back in Central Illinois. I gave up on her lessons after she backed our red Chevy Colorado into a corn field at dusk one evening. Thankfully, a more patient Filipina, her Ate Lourdes, continued the lessons and at the age of 40, my aswas had her own license for the first time in her life. We had four Chevy Colorado trucks in the States. The one above was smashed by a middle-aged woman that was attempting to drive and text. 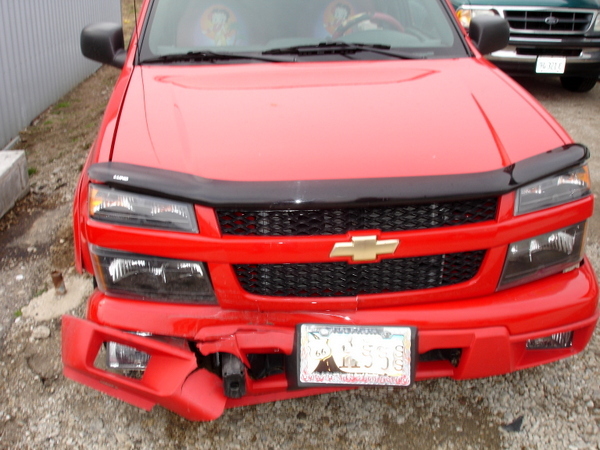 One was hit by a deer in the early morning hours on the way to work one day. I will have to go to the Land Transportation Office in Iloilo to apply for a new license as my Illinois Driver’s License expired over two years ago. Will I have to take the written and driving test again? Depends on who I talk to. I really don’t want to have take any tests. ← Lolo’s Dementia: He Punches Me in the Face! Thanks for the info, Pantera. Glad to hear your Isuzu is still running and that spare parts are available. That’s good to know. Sounds like the best deal for you. Automatic is a must here with all the traffic stop and go. I haven fallen in love in love with the Ranger, yea i know its a Ford lol. I just like the sporty look to it and it has the ecosport engine in it. But i’ll have an open mind and check out other brands. We have most of the dealerships here. The Chevy Dealer here is located in a supermarket, which is different. The Foton has many imported parts including the Engine. Will you be getting a diesel engine? I don’t think i’ve seen any newer truck here with a single cab. It won’t be until maybe August/Sept next year before we get one. Yep, I know the Tom Cat shares your opinion of the Ford, Papa Duck. It is a sporty looking truck, that’s for sure. I’ve never heard of a car dealership in a supermarket but this IS the Philippines.Yep, we will be getting a diesel engine. Come to think of it, I haven’t seen any single cab trucks running around here either, aside from those little Suzuki model pick-ups Rusco is selling. I have always been a GM guy also, but these days with all the hi-tech involved in all brands, I think Ford is just as good as any brand out there. Do they sell full size pickups there like the 1500 or 2500 series of Chevy trucks? I cant imagine trying to maneuver a full size pick-up with a 8ft. bed and and club or especially a crew cab around there on most streets I have seen or parking one in most mall parking lots there, they are hard enough to park them in most spots here. I have never had one, but Isuzu sure seems to be popular there and in most places I have been in Asia. And unlike here, diesel engines are so much more available I think in many models arnt they, seems I saw a lot more of them there or somewhere in Asia. Yep, even the Silverado 3500 is available, Bill S. My asawa and I would never travel around Iloilo with our truck but with we will be just fine on our island province of Guimaras, especially with the new road projects which have doubled the width of our existing main roads. Our new property has a private road which is in bad shape, especially during the rainy season, and needs a big rugged truck to navigate said road. With the aforementioned road project, many folks are now parking on the side of the road as it has made a lot more parking spots available. I owned five vehicles with isuzu engines.Isuzu engine is very durable.Easy to trouble shoot unless it requires overhauling.In the Philippines where rebuilding of vehicle is allowed,it is very easy to secure spare parts even in second hand auto parts you can find isuzu engine parts. I am not a fanatic fan of Isuzu engine but I tell you there was a time I am running my Wrangler jeep with C190 Isuze engine for almost 12 kilometers without water from my radiator because it incurred damage without my isuzu engine being overheat.Luckily I discovered the damaged. Congratulations for having a passenger truck. I have friends from Land Transportation Office perhaps I can help you in getting your license.But anyway I know your asawa have a lot of friends here in Iloilo City that can assist you. Land Transportation Office have a District Office in Guimaras, perhaps you can inquire from their office or even secure a license from their office without going to their Regional Office in Iloilo City. Thanks for the input, Edwin. I really appreciate the info. Yes, Isuzu wasn’t our first choice but I’m glad to hear such good reports such as yours. I have a expat friend in Guimaras who informs me that an Isuzu crew from Iloilo City comes to our island every Saturday to do any necessary repairs or maintenance. We definitely need a passenger truck as we have a load of relatives we can now take to the beach instead of hiring a multicab. The truck will be very useful especially with the new construction going on at our property. I just passed up our local LTO in Guimaras yesterday and will download the necessary forms and pay them a visit. Hopefully I can acquire my license here; that would be very convenient. Looks like I will be reduced to using my Kawasaki motorcycle as wife has claimed the truck. Just for everybody’s information I am now coming on to 64, my wife is now 40…married nearly 12 years and have a 10 year old son…. Welcome and thanks for the info, David. There is absolutely no way I would ever attempt to try and teach my wife to drive a stick shift. She is quite comfortable driving an automatic and as we Yanks like to say “if it ain’t broke, why fix it?” Glad you could keep your wife happy, you are an extremely wise man. My wife and I have been married 15 years next month, no children. I’m sure your son will have quite an adventure in the Philippines. I’m only two years younger than you but I would never reach 64 if I run about on a motorcycle. I can pedal a bicycle but doubt I can navigate a motorbike safely even on our little island where 86% of all registered vehicles are motorbikes and many of them Evel Knievel wannabee’s. Thanks again for the kind words.